Oooh, Shinies! : Aaaahh! My eyes! I heard the application was a bit sucky, but I didn't have too much trouble with it. I found that if you use just a little bit of polish, you can easier pull bald spots into the previous layer(s), so I just used more polish. With enough polish on the brush you don't have to go over the same spot several times, and because it dries very fast, it doesn't matter if the coats are a bit thicker. 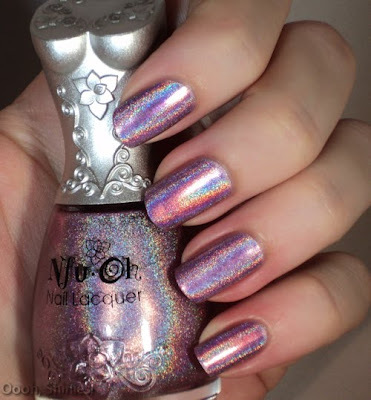 The only downside so far is that I'm wearing this awesome holo, and there's no sun! But it's so holo, that it doesn't matter. I had a very hard time trying to capture the color without the holo, because it's pretty much always there. 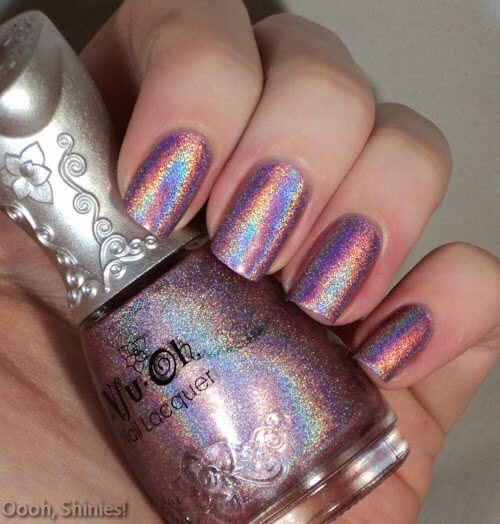 This eye blinding polish also comes in the cutest nail polish bottle out there. 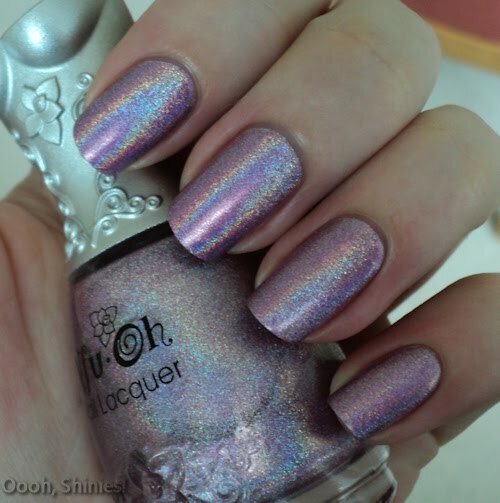 The polish dries up a bit matte, but it doesn't really show because the holo makes it looks shiny. My pictures are taken in a lightbox, hopefully there's some sun later so I can take some pictures in the sun as well. This picture shows the color of the polish a bit better. 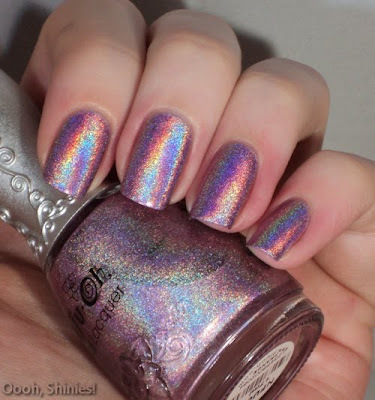 And for this picture I tried to really show the polish without holo, which was hard. 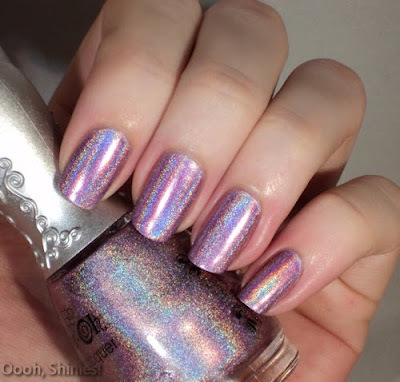 The quality of the picture isn't that great because of that, and still you can see the holo! I also ordered the Nfu.Oh cuticle remover, because I heard a lot of good things about it. I never have issues with my middlefinger, ringfinger and pinkie cuticles, but my indexfingers and thumbs can be a bit stubborn. The remover is pretty thin, and I think the bottle will last me for a long time. I applied it onto my cuticles, and when I had it on my pinkie, I started to remove it from my thumb.